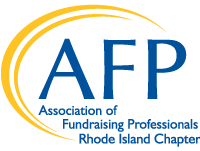 The Association of Fundraising Professionals Rhode Island Chapter (AFP-RI) advances philanthropy through education, training and advocacy. Chapter members include nonprofit professionals with diverse backgrounds representing a broad range of organizations as well as industry and corporate partners. Membership provides an excellent opportunity to network with peers, learn the latest in best practices and take advantage of professional development sessions that will advance your organization’s fundraising success. Conference – The Chapter hosts a fundraising conference including educational tracks for all levels of experience, nationally recognized keynote speakers and great networking with other professionals. Members receive a significant discount.